Is what I should have said, but didn’t on September 27, 2016 , the date of my last post. This post is to explain why I left the blog, and why, unlike the unlucky Captain, i came back. 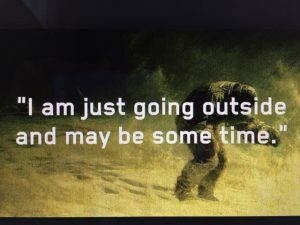 The immortal line above was from a very brave and doomed Englishman, the legendary Captain Lawrence Oates, who stepped outside to his death because he felt he might be a burden to his companions. It was not uncommon for men of that era to sacrifice themselves for what they felt was a greater good. Millions did so in the two world wars. Voted Remain: 75% percent of Brits 24 and younger, 56% of Brits 25-49. The other disaster of 2016 was Trump. Here are those voting figures. Voted Trump: 52% of all Americans 45 and over. Both Trump and Brexit really bothered me in 2016 and they really bother me now. I wrote this piece about trade options for Brexit on 2 September 2016, and the situation is exactly that ugly now. No progress has been made. Many people, including those who voted Leave, are effectively putting their hands over their ears and ignoring the disaster that is inching towards us. The Brits are shell shocked and everyone is disillusioned about the progress we have made since the referendum. It’s a complete slow motion train wreck. One hot evening in June of 2016 I spent 6 hours haranguing my baffled, but very polite naturalised American brother about what would happen, if as I expected Trump was elected. It all happened as I described, but it’s been much worse than my worst fears. But in terms of In terms of current approval, 40% of Americans still favourTrump. And 48% of Americans who regularly attend religious services, and 48% of Americans over 65 also approve. Of Trumps current performance. Of his manic, lying, cheating, unhinged, dangerous performance today. The depressing thing is that it is my generation that has put us in this mess, and much of my generation is quite OK with it. And as you might imagine, it is my generation that make up the bulk of my friends and acquaintances. Somehow you have to bump along with people who have done something you regard as profoundly damaging. In the year leading up to Brexit and Trump, I put a lot of passionately argued content onto Facebook, to communicate with more people on the subject, and to learn their views. In the face of the Russian onslaught it meant nothing of course. Worse, my brief foray into the world of Facebook told me a great deal of really depressing stuff about people I otherwise very much liked and respected. Then came the appalling revelations about what a cynical and deeply compromised organisation Facebook is, and we all heard the repeated lies of Zuckerberg and his cronies that it would all be fixed when they had no intention of doing anything of the kind. So I withdrew completely from Facebook. It’s been a year now, and today I am a bit conflicted. On the one hand I am absolutely certain Facebook is a dangerous and possibly malignant operation, at least in what its effects have been on democracies all over the world. But on the other hand, I miss the hundred or so genuine friends, made over 50 or so years, most of whom I have no other way of communicating with – at least not on the ‘postcard’ basis that FB allows. That’s why I disappeared from this blog, and why I am now back again, and figuring out what to do and where to go with this site. It’s also why I have put out a few tentative posts on FB again, although I am really not sure what to do there. Whatever happens with FB, this web site will be my home for long form comment and large scale photographs. In future posts you will see more of both. Like many people, I have a Yahoo account (for news updates and Flickr). Now it appears that 500 million Yahoo accounts, including probably mine, have been accessed, by a ‘foreign state actor’. And 200 million of them are now for sale on the dark web. I regarded Yahoo and other non-financial and non-critical sites as a low risk, and used the same password on many of them. I just did an analysis of how many places I had used the same password. It turns out to have been 60! Quite a lot. Some of those have information like phone numbers and my address. So I have just been through them all, giving them strong individual passwords. I suggest you do the same. But just how risky is this breach? The stolen Yahoo passwords are supposed to have been encrypted. The most widely used ‘strong’ password encryption standard is ‘salted MD5 hashing’. Technology has moved so fast now that anyone with a $400 Nvidia PC graphics card (GPU) can use ‘brute force’ to decode these passwords. The table below shows the real impact on the time it takes to crack a password of the number of characters (first column of the table) and the complexity of the password (first row of the table, ranging from numbers only on the left, to numbers plus lower and upper case letters on the right). So how long does it take to decode a strong (salted MD5 hash) password in seconds? Not long it turns out. A 6 character password using a mix of lower case letters and numbers which you might have thought to be quite secure, takes just 4 seconds to crack. That cracked password is worth real cash to a hacker, so for 4 seconds on some cheap PC hardware, they are going to invest some time and money. If you had a Yahoo or Flickr account you are highly vulnerable. The moral is, use AT LEAST a minimum of 8 characters with a mix of lower case, and upper case characters, symbols, and numbers (that combination would take 5 days to crack with today’s GPU cards). Yahoo say that ‘the majority’ of their passwords were encrypted with the stronger ‘bcrypt’ method. 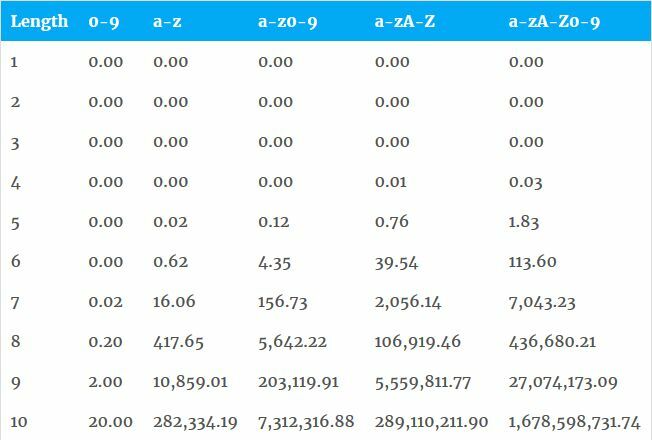 But it’s only a matter of time before the speed of the GPUs and the smarts of the hackers (this table is produced by a hacker) will catch up with that also. And in the recent breaches of Dropbox, Linkedin and Adobe, the passwords all had very poor (SH1) or NO encryption. So be careful. Make sure all your passwords are long, strong, and unique! This is (as far as I can make it) a factual analysis of the trade options (highlighted in bold) following Brexit. It shows there is no option that meets the “Leavers” goals, and every variant other than the one we are just about to leave, is pretty bad for the UK. Note that all the picture links lead to the original, more detailed data source. 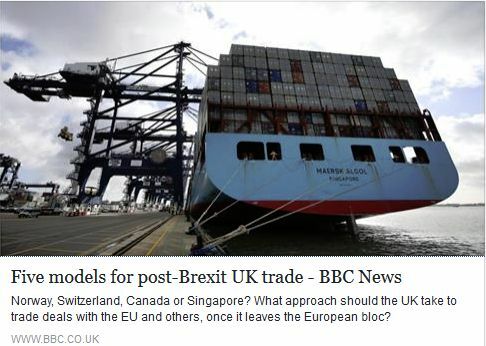 These are our choices (the above BBC article explains more): The Norway model and the Swiss model have free trade, but also everything Brexiters hate (free movement, and the same contribution to the EU as now) with no say at all in the decisions the EU makes. They both will sacrifice the City of London’s EU trade. The Norwegian Prime minister’s opinion of their model in the BBC video clip above (click on the picture above to get to the BBC article) indicates that in her informed opinion, it is not a good option for the UK, even as it stands. Some Brexiters say that the Swiss, who recently had a referendum to limit free movement, will renegotiate with the EU to get the kind of “free trade – no free movement” that they want. In fact the UK just made it almost impossible as the Bloomberg article on the left shows. 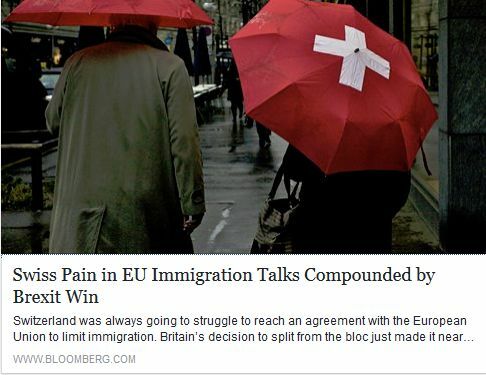 As Bloomberg notes: “Switzerland was always going to struggle to reach an agreement with the European Union to limit immigration. Britain’s decision to split from the bloc just made it near impossible”. The Turkish model sounds attractive, but as my prior post outlines, it severely restricts negotiating power with other countries, still disadvantages the Commonwealth, there will be no easy access of our people into the EU, and it excludes services. Then there is the Canadian model (CETA). It is good for manufacturing (no tariffs) OK for agriculture (some tariffs) and dreadful for the City (services are excluded). 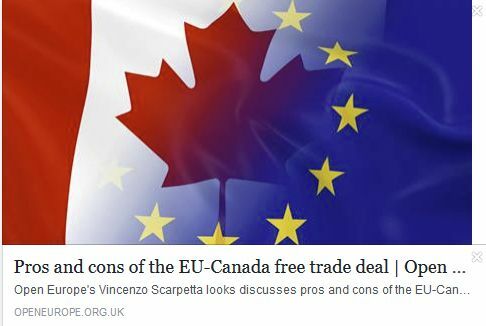 Canada is still negotiating their deal with Brussels – they have no favoured status at the moment, and are on WTO tariffs. CETA requires ratification by every EU country, and is being held up by those countries who do not have visa-free access to Canada. The same will certainly happen to the UK in this or any other negotiations. The Canadian process started in 2009, was agreed in draft in 2014, and is still not in place. So assume it will take us a good long time to get a deal, at least 7 years. Everything else is the WTO tariffs, and these will be the default after the 2-year Article 50 period expires (in the absence of or pending a negotiated and more favorable trade deal). The tariffs range for the EU from 40% for baked goods to 10% for cars. It will massively disadvantage manufacturing exports, and eliminate the benefit of devaluation for exporters. Those who think that Germany has to allow tariff free access to their markets so they can sell BMWs here should ask what else are the rich English going to buy. Audi, Mercedes, BMW, Volvo, Alfa-Romeo are all EU imports. Jaguar does not have the capacity, or the range to backfill this volume. They would be unlikely to invest in the UK market opportunity until they were certain that the UK was keeping punitive tariffs on EU luxury cars permanently. Without a massive Jaguar expansion, the British will continue to buy European luxury cars, because that’s the place that makes 90% of them. European manufacturers will just put prices up 7% and take a 3% hit on profit, and they are done. No special bargain should be necessary for them to continue to profit from the UK market. And I think you will see the rich Brexit voters of rural England continue to swan around in their German cars, just like before. Business for Britain, which campaigned for exit, estimated that at worst (ie. at WTO levels), tariffs would cost British exporters £7.4 billion a year and said the UK would save enough on EU membership fees to be able to compensate exporters for that. The bill to minimise the impact on exporters would therefore be £7.4Bn per year for at least 7 years, and presumably a reduced, but significant amount after that. But the UK also has to compensate farmers, Wales, Cornwall and the other recipients of EU grants for their loss of support. This will likely wipe out our saving on EU contributions and more. And the huge amount of additional certification required for non-EU importers and the work to renegotiate the EU treaties, and trade deals with 50 other countries will be a massive consumer of resource. The country is going to expend vast amounts of effort just to get us back to a position similar to where we are today. Far from entering the sunlit upper pastures, we may well waste 9 years of work for no economic advantage at all. On that basis, and on the outlook of most market analysts, a recession is certain. The EU has made it very clear there are no fantasy Johnson/Gove/Leadsom/Hannan timescales or trade deals. 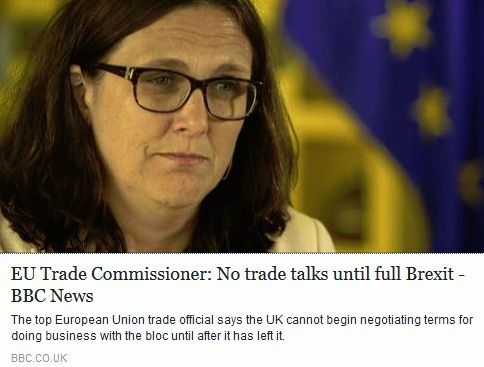 Cecilia Malmstrom, the EU trade commissioner who will lead all EU trade talks has made it clear that all elements of the UK withdrawal from the EU have to be completed (in 2 years) before any trade talks have started. One of the candidates to be next UK prime minister, Liam Fox (certain to be in the new Conservative front bench) called Ms Malmstrom’s stance “bizarre and stupid”, saying the Brexit talks would include trade (the BBC’s Chris Morris in Brussels says Ms Malmstrom’s view of two consecutive sets of negotiations appears technically correct). I would suggest that starting negotiations by calling your lead counterpart “stupid” almost guarantees a bad result. No EU official has indicated that the UK can get tariff free access to the EU without their four principles (including free movement of people) being adopted. While various organizations and individuals in Europe have said a deal could be struck that might meet UK needs, they are not going to be doing the negotiations. Those who will be, have been very clear. I can find no senior politician on either side in the UK who seems to have a coherent understanding of this dilemma or has a pragmatic plan to get an effective negotiated result for the UK. All the Conservative front bench seem to be expecting a fantasy of access to the free market without free movement of people, which the EU has made clear is not an option. Jeremy Corbyn, the Labour leader,has said he wants the EU exit Article 50 to be implemented immediately, precipitating an immediate start of the 2-year exit clock with no trade deal in place at all. Nigel Farage wants the same, and today they have been joined in the “immediate Article 50” camp by Andrea Leadsom, the hedge-fund backed Conservative leadership contender. John McDonnell, the Shadow Chancellor has predictably said something quite different. At the Royal Festival Hall in London, he announced five principles upon which Labour will judge any negotiated deal and which would have to be met for Labour to give backing for a vote to trigger Article 50. They include, freedom of trade for UK businesses in the EU, the rights of UK financial services companies to win business across the EU, existing protections at work provided by the EU to be maintained, and no UK citizen currently living or working in the EU to have their rights affected. From what the EU have said so far, I would suggest that none of those are likely to be delivered. In that case, McDonnell says that Labour would not vote to support Article 50 being exercised, entirely at variance with Corbyn’s position. It seems pretty clear to me that almost all senior UK politicians are in a fantasy world, and are wholly at variance with the EU, who hold all the negotiating cards. When professionals take over, the process will settle down somewhat, but I don’t expect a rosy outcome. I would expect some kind of Canadian style free trade deal ultimately, with the City’s role as an EU financial hub being sliced up and given to the Irish, French, Dutch and Germans. Inward investment to the UK for car manufacturing will probably slow down and move to the cheaper EU countries like the Czech republic and Bulgaria etc. UK citizens in France and other EU countries will lose reciprocal/free medical treatment, and many will have to return because of that and the dire effect of currency devaluation on their income and expenses. But of course it could all be much worse than that, if we have to fall back on all that, plus WTO tariffs for 7 plus years. What about Scotland? The current market view (as of today) is that oil would have to be at $130 per barrel before Scotland’s deficit would meet EU membership rules. The rest of the UK is currently funding the Scottish deficit. If Scotland left the UK and joined the EU, they would have to accept the Euro, accept WTO tariffs for exporting into the UK (80% of the Scottish export market), accept a customs border with the UK, and accept German austerity rules for managing their deficit (which would be greater than Greece’s). While the rest of the UK would probably be better off on a purely economic basis, it would be a massive diminution of the UK’s world standing, particularly if Scotland is followed by Northern Ireland. However economically unattractive, EU membership may well be an achievable option for Scotland to pursue if they want to. Dr Kirsty Hughes, in the only practical expert analysis on Scottish membership of the EU I have come across so far (see the link to the left), concludes that the Scots may have a fair chance of EU membership, but only once they are an independent nation. Given their good relations with the EU, the Scots are also much more likely to get concessions on accession, than the UK will on exit. She also has said, quite reasonably, that the Scots will not want to go through the whole pain of the UK leaving and renegotiating a trade deal, before starting their own accession talks. Instead, they should be negotiating their own trade deal at the same time as the UK is doing theirs (or even before). If that is their goal, they need to get their referendum done in the first half of next year, and be fully independent of the UK by the end of 2019. The EU might well be flexible then on continuing trade terms for Scotland (and tough on exit terms for the UK) while they negotiate accession. There are many other radioactive elements of the EU decision, but trade is the critical one that will affect everyone’s lives. This summary of the options and likely outcomes is a marker post for me and I’ll come back to it over the next few years to see how it all panned out. You might want to as well. But like many in the UK right now, I don’t think this particular story is going to end well.